Thanks to an email typo, a man from Phoenix is going to be attending a bachelor party in Vermont this weekend. The catch? He’s never met the groom. We caught up with him for an exclusive interview. On Monday, Jan. 7, 2019, Will Novak of Phoenix, Arizona got an email with the subject line: “Angelo’s Bachelor Party.” Novak doesn’t know anyone named Angelo and his first reaction was to write it off as spam. He didn’t and in the last 48 hours a bizarre turn of events has Will Novak coming to Vermont for a free ski weekend to attend a bachelor party for a guy he’s never met, and he’s getting a free lesson from Okemo. We spoke with Will Novak (of Arizona) today and got the story of how it unfolded. I do not know who Angelo is. I am a Will Novak who lives in Arizona. Vermont seems like a very far way for me to travel for the bachelor party of a guy I’ve never met.That being said: (expletive) count me in! From the contents of this email, Angelo sounds tremendous and I want to help send him off in style. I hope his bride (or groom) to be, is awesome. I should note that being a desert dweller, I’ve only been skiing once and I was real bad at it. I hope you all are patient with me on the slopes. In exchange for said patience, I can bring my sweet Nintendo Switch so we can play games in the cabin/chalet/whatever in the evenings. If Angelo isn’t into video games I’m happy to bring suduko puzzles or just Indian Leg Wrestle or whatever he likes. I do find myself tripped up on what to wear. Clearly the direction of asking “what would Angelo wear?” Is a good one. However, again, I do not know him. I once got a wrestling singlet worn by “Hacksaw” Jim Dugan after a WWF event I attended in 1989 (don’t ask how- that’s private), I can just wear that- though it may not be cold weather conducive. I wear a size L shirt. I am 35, so I’m not sure where that puts me in age priority in terms of beds. But I always travel with a foldable hammock, so I’m good no matter what. f you can all advise me on the nearest airport to fly into, I’ll make arrangements forthwith. PS if there’s ANY way I can get a discount on the $150 price, considering I don’t know how to ski, have to fly across the country and have never met this person, that’d be super appreciated. If that’s not amenable, I totally get it- I want to be there and support my man Angelo. We all agree, we are all very excited to meet you. As you sound tremendous as well! We agree that your timely response may have been one of (if not the best) responses to an e-mail that has ever been sent. And we insist on you coming—this would surely make Angelos day. We can pick you up from the airport. We will provide an outfit that fits though I would agree the wrestling outfit will do just fine. I am sure we can scavenge some money to help your cause and eliminate some cost for sure. Don’t worry about the video games, but bring Sudoku puzzles (Angelo loves those), and yes we would prefer Indian Leg Wrestling. Your age of 35 fits right in, but unfortunately falls into the [bottom] half [of] the age bracket, [so we] would suggest bringing your folding hammock. – Flights from Arizona that weekend are $230 RT. If we buck up an extra $ each we can help you out for sure. I don’t see why not—it sounds affordable to me. – You can either fly into Newark airport in NJ, or Albany, NY. We will be waiting with a suit for you to wear and adequate transportation to Vermont and back to the airport. – If you don’t ski well you’re going to learn, and if not, [there are] plenty of bars and restaurants to where you can “hang out and put out the vibe”. – Picture so we can identify you at the airport upon arrival. You’ll know who we are you can’t miss us. – Facebook or something we can at least check you out, we are crazy but not stupid. I am sure you can understand this little request. We look forward to meeting you and helping us send Angelo off. If you think we are kidding we are not. You better be coming, as we all are all dying to meet you. Not only will this be a weekend Angelo will not forget it will be one you surely will not forget as well. “I won 2 gold medals in Karate in 2nd grade and I am well trained in the deadly martial arts,” wrote Will Novak to the group of Angelo’s bachelor party friends, along with this photo of himself, which will now appear on the back of the bachelor party t-shirts. 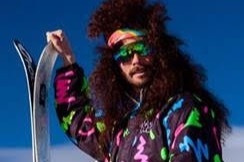 Watch out for them and their wild and crazy ’80s ski garb at Okemo this weekend. Though the crew of 20 bachelor party invitees offered to pitch in, Will in Arizona was daunted by the cost of an unplanned trip cross-country. He and his wife Veronica have a 10-month-old baby daughter and just remodeled their historic Pheonix home. However, Angelo’s pals were adamant that he should join. “One of my buddies told me to start a GoFundMe page. I was like, who would contribute to this? So I put one up, thinking I would prove my friends wrong,” said Novak. After clearing the trip with Veronica, he launched the page on Thursday, Jan. 10 just before dinner. By the time he and his family were finished eating, his travel expenses ($750) were more than funded. When Will learned that Angelo and his fiancee Devon are expecting their first baby, he decided to donate all funds beyond the $750 to cover his travel costs to the couple for a “whatever the baby needs fund,” for food, toys, college or other expenses. His goal is to raise $2,000 for them, which he plans to present as a giant check a friend had custom-made for him at FedEx this week. “My wife and I just had our first kid and I really think that $2,000 would just be an amazing way to help launch them forward.” Donations can be made here through the weekend. He knows that Angelo’s father, also named Angelo, will be there, and that the wedding is scheduled for the following weekend. For accommodations, the bachelor party will be staying at a member of the party’s home in Proctorville, Vt. and promises to hit the bars. All are welcome to join. “I want this to be an epic send-off for Angelo, for him to feel like the whole state of Vermont is wishing him well this weekend,” says Will. Will is also excited to check out Vermont. He’s only been once, while he and his wife were living in Boston, to go apple picking outside of Burlington.